The largest High School Country Fair is held in my neck of the woods in Michigan, at St. Mary's Prepatory School on Orchard Lake Rd, and is well worth a visit if you're in the area this Memorial Day weekend. So we took the kids yesterday and had a great time, this has become part of our annual Memorial Day weekend activities and its fun to watch the kids grow and be able to try new rides as they get bigger. Parking was $7, an all-day wristband for all rides for Abby was $22, a sheet of tickets for the little one and the adults for occasional accompaniment was another $20. A bottle of good Polish beer was $5, a plate of Polish delectables $10, and then the obligatory cotton candy and other sweets added up. The results: An absolutely perfect day, with Abby saying it was the best day EVER - which is worth it no matter how you slice it. Abby went up the huge fun slide all by herself, which was quite an accomplishment. She also went up a very high ride with rope ladders, rickety bridges and a large slide aptly called Raiders - watching her make her determined way up was quite heartstopping at times for the parents. She also went on both Carousels multiple times, and on the Kid Model T ride, and she took her sister on it and the train ride, so she definetly used her wristband for all it was worth. There were plenty of arts, crafts, and products on display for sale or mere browsing, and lots of live entertainment. Polish Muslims? How does that work? Is it like: "Hates Jews, but can't remember why"? Or is it: "Ready to charge American Tanks on horseback?" Or is it: "Communism wasn't bad enough, lets try Islam?" For entertainment do they blow up backwards? Actually the Polish Muslims are a pretty funny music group out of Hamtramck, with a darn curious name. St Marys Polish Country Fair is a great Country Fair and if you in the area, go to it, you'll have a great time, the kids if you have them will have a great time, and the fair acts as a fundraiser for the school so you're helping out a worthy cause while having a great time. For the Kickoff dives of the 2008 Wreck Diving Season, I along with Jerry and Rob drove up to Port Sanilac on Friday night. We stayed at a motel and after realizing that nothing in Port Sanilac was open, drove to Lexington for breakfast. Returning to Port Sanilac, we went to the Marina and met Captain Venet of Rec Tec Dive Charters. We loaded out equipment on board and after a while more divers started showing up, with James, Terry and Chad coming in last but at least before the boat left the dock. The water was nice and clam, with the sun shining as we arrived at our first dive site. 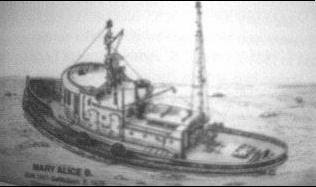 The first dive was on the Mary Alice B., a steel tugboat built in 1931 that sank in 1975, and not found until 1992. The dive was cut short as Rob wasn't feeling well, so we aborted the dive. Unfortunately, Lake Huron decided to play some tricks. When we surfaced, instead of calm we faced 5 foot waves that were rocking the boat nicely and making getting back on a challenge. The swells continued for most of our surface interval, so Captain kept the boat moving, and once it calmed down we prepared to enter the water, which was still somewhat choppy, for our second dive. 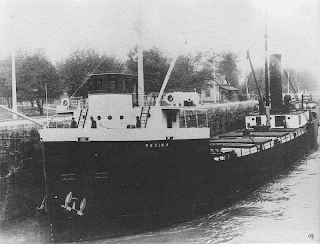 The Regina was one of the lost ships of the Great Storm of 1913. Like the Wexford, the Regina was lost with all hands in the storm, and Regina was not discovered until 1986. As there were no survivors, no one knew the exact location of the wreck. The greater mystery was that bodies of sailors from the Charles S. Price, another ship lost in the storm, washed onshore wearing Regina lifejackets and vice versa. This mystery has never been fully solved -- Did the Price ram into the Regina, accounting for the hole in the side of the Regina? Did looters accidentally switch vests after plundering the bodies of the sailors? 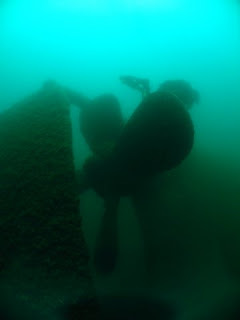 The mystery heightens the excitement of diving this interesting wreck. The Regina rests on the bottom upside down, with its huge propeller and rudder intact, which is an awesome sight. A debris field surrounds the ship, including her zebra-museel encrusted smokestack, with soot still visible inside. The Regina is an awesome dive. I'm not yet cave/wreck certified so I didn't try going inside, nor did Jerry. Instead we watched James, Terry and Chad, who are certified, run a line and go in. We watched them through the portholes as they explored the interior. James took a video of both the Mary Alice B and Regina dives and once he's finished I'll link to it. I am going to buy a case for my digital camera, as my team mates forgot theirs, so no original pictures in this post -- but the next wreck will have some. Jerry and I descended onto the wreck and examined the Prop, rudder, smokestack, and looked through the portholes, and then Murphy decided to show up. Jerry's drysuit, and my drysuit started flooding. Mine wasn't very bad as the thinsulate insulation garment kept me warm even as I was getting wet, but Jerry had on fleece that once wet in the 45 degree water got him cold quite quickly, so we had to thumb the dive. Because both dives on these wrecks were incomplete, I'll simply have to go back again, as if I needed an excuse to visit these cool wrecks once more. The current crop of leadership of Detroit find themselves at the pearly gates. St. Peter is a little confused and notes that he's never had an city councilman or mayor from Detroit ever show up at the gates. They insist they're there properly and St. Peter goes off to check with God. 'What? All of the Detroiters are gone?' asked God. Given Kwame' downfall was due to the text messages he sent, on Detroit City equipment his new policy seems to be in anticipation of his next scandal to try and keep private the texts he may send the next time around. Of course, this new policy certainly hurts his current case, because if he had to make a new policy that City employees now have some expectation of privacy in their text and electronic communications on City equipment, he certainly lacked such an expectation up until he issued this policy today. To add to the fun,the purported date of the effectiveness of this policy, just unveiled today was April 15.